Figure 1. 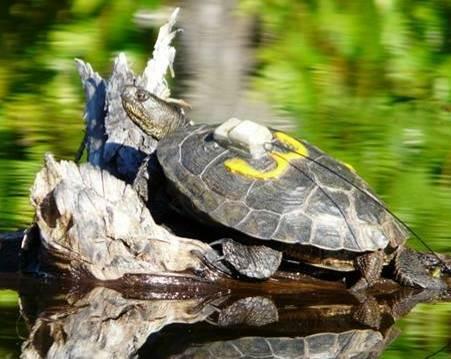 Adult female western pond turtle with an attached radio transmitter and identifying number for population monitoring. Photo by Melissa Reitz. The western pond turtle once ranged from the Puget Sound lowlands through western Oregon and California to Baja California. Historical declines of this species resulted from commercial exploitation for food, alteration and loss of habitat, and introduced predators such as bullfrogs and large-mouth bass. Western pond turtles were essentially extirpated in the Puget lowlands by the 1980s. By the mid-1990s, they were found in only two small populations totaling about 150 turtles in Skamania and Klickitat counties. The western pond turtle has declined throughout its range, but is still locally common in parts of California and Oregon. Recovery in Washington will require long-term efforts because the turtles grow slowly, requiring up to 10 years to produce their first offspring. Survival of hatchlings in the wild was believed to be near zero based on the lack of recruitment to larger size classes (Hays et al. 1999). 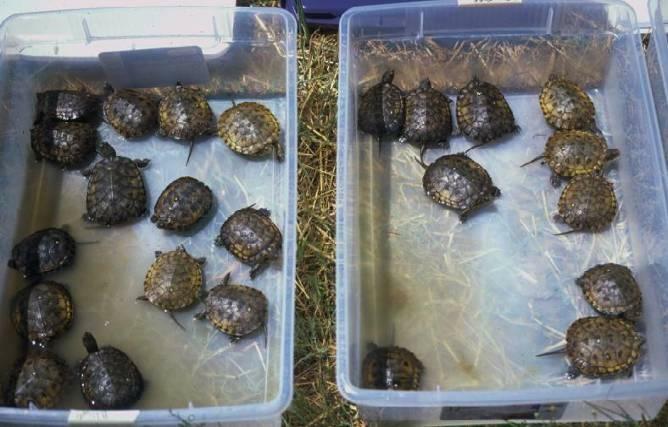 To address the high mortality rate of small hatchlings in the wild, especially due to predation by bullfrogs, a head-start program was initiated with Woodland Park Zoo, and later with the Oregon Zoo (Vander Haegen et al. 2009). A captive breeding program was also started at the Woodland Park Zoo to build a population of turtles for release into suitable habitat in the Puget Sound area. Wild hatchling head-starts are reared with hatchlings produced from captive breeding (Figures 2). Unlike wild turtles, zoo-reared turtles are fed throughout the winter in a controlled environment, so by their summer release, the 10-month-olds are about the size of 3-year-old turtles in the wild. The young turtles are released at established sites to augment populations or to establish additional populations. Head-starting is an interim recovery strategy until efficient and reliable means of bullfrog control (possibly a combination of gigging, trapping, egg mass removal) are developed and implemented at occupied sites. Head-started turtles reproduced in the wild for the first time in 2001. The captive breeding program was ended in 2010. The recovery plan objectives are to have 7 populations greater than 200 individuals each that are sustained by natural recruitment of juveniles, with 4 populations in the Columbia Gorge and 3 in Puget Sound (Hays et al. 1999). As of 2011, two introduced populations occur in Puget Sound (one in Mason County and one in Pierce County), and two reintroduced populations and two natural populations occur in the Columbia Gorge. These populations do not yet meet the needed size, age distribution, and natural recruitment required for down-listing and recovery. Columbia Gorge recovery actions. In 1992, WDFW began acquiring land in Klickitat County that hosted the largest turtle population remaining in the state; it is now managed as part of the Klickitat Wildlife Area. In 2002-2003, the U.S. Forest Service acquired over 200 acres of western pond turtle habitat at the Skamania County site that contains the second largest population in the state. Improvements for the benefit of the turtles have been ongoing at both sites. The first reintroduction site for western pond turtles in the Columbia River Gorge was on Pierce National Wildlife Refuge in western Skamania County. The goal was to establish the third of four populations needed to recover the pond turtle in the Gorge. A total of 343 turtles have been released at this location since 2000 (Table 1). From 2000 to 2004, telemetry was used to document survival and mortality of 68 head-started turtles released at the refuge (Vander Haegen et al. 2009). Survival estimates for first year and older turtles ranged from 86% to 97%, with no differences among age classes. Subadult turtles released at >90 mm carapace length apparently avoided predation by bullfrogs. High annual survival and nesting by head-started turtles was indicative of successful recruitment. A second reintroduction in the Columbia River Gorge began in September of 2007 with a release of turtles at ponds in Beacon Rock State Park in Skamania County. As of 2012, 182 head-started juvenile turtles have been released (Table 1; Holman and Anderson 2013). The western pond turtle program in the Columbia Gorge continues to make progress. Since recovery efforts began in 1991, 1,357 head-started turtles have been released into suitable habitat within their historical range in the Gorge (Holman and Anderson 2013). The populations were estimated using mark-recapture at Bergen (86) and Pierce (41) in 2011, and Sondino (246) in 2012 (Holman and Anderson 2013). Turtles now occupy 4 distinct locations, with sexually mature males and females present at 3 of the sites. A significant milestone was documentation of nesting by pond turtles at Pierce National Wildlife Refuge in 2010 (Holman et al. 2012). Control of bullfrogs and habitat enhancement efforts are ongoing at Gorge sites. In 2011, a total of 525 frogs or tadpoles and three bullfrog egg masses were removed; 6 bullfrog egg masses were removed at Sondino in 2012 (Holman et al. 2012, Holman and Anderson 2013). South Puget Sound recovery actions. The first western pond turtle population re-established in the South Puget Sound region was at an excavated pond complex in Pierce County (Figure 4). This site is a 12-acre compound that includes a 3-acre wetland mitigation site constructed by Pierce County Public Works in 1994. Turtles from the Woodland Park Zoo were first released in the summer 1996, with a total of 238 turtles released by December 2012 (Table 1). Survival and growth of head-started juveniles has been high compared to that reported in wild populations. The first hatchlings from wild nests were produced in 2001. A habitat enhancement project funded by the Wildlife Habitat Incentive Program was completed at the Pierce County site in 2008-2009 and included control of Himalayan blackberries and the addition of 1,000 cubic yards of topsoil. This project improved the habitat condition of the nest hill. Meeting the recovery objective of having a population of >200 turtles may require creating an additional pond complex using an existing spring-fed seep. This could double the population and take advantage of a more desirable south-facing hill for nesting. In 2012, 6 basking logs, donated by Weyerhaeuser, along with 4 from Scatter Creek Wildlife Area, were installed at the turtle ponds at the Pierce County site. Reestablishment of a second population of western pond turtles in the Puget Sound region began in 2005 at a shallow 20-acre warm water pond in Mason County. The site is relatively secluded, but close to additional wetland complexes that may allow the turtle population to expand. The project required habitat enhancement, translocation of turtles, and monitoring survival and nesting activity so eggs could be collected for head- starting. To create and maintain habitat, logs were cut from downed trees and anchored throughout the pond to provide basking sites. Nesting habitat was provided by clearing the nest hill. Removal and control of scotch broom and blackberry has been ongoing. The first reintroduction effort in 2005 began with the relocation of 22 turtles from the Pierce County recovery site and the release of 21 turtles from Woodland Park Zoo. In 2012, 48 head-started turtles were released, bringing the total number of released turtles to 270 (Table 1). Annual survival has been high, with the probability of surviving from 2005–2012 estimated at 96%. Growth in all age classes has been good, suggesting ample food resources. The number of nests has increased from 1 in 2006 to 6 in both 2010 and 2011, and 5 in 2012. No hatchlings were produced at the site through 2010, so in 2011, all 43 eggs were removed and transported to incubators at the Woodland Park Zoo. The 43 eggs produced 36 hatchlings. In 2012, 39 eggs were collected; of these 5 were broken in the nest, 14 hatched at Woodland Park Zoo, and 9 were still in incubation as of December 2012. Observations from 2010 suggested that the rock content of the soil at potential nesting sites made it difficult for females to excavate nests. There were occasions where turtles laid their eggs above ground or in the water, and struggles were apparent with the long hours turtles spent on land, the numerous scrapes and test holes dug, and the large number of broken eggs recovered. 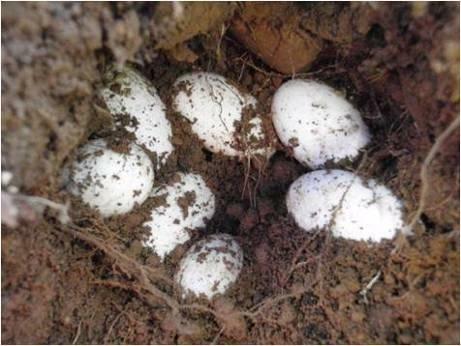 When turtles were successful in excavating a proper cavity they were unable to form a compact nest plug and filled in their nest cavities with whatever rocks and loose soil they could find, breaking numerous eggs in the process. In 2012, 10 cubic yards of a sandy soil mix was hauled in to provide more suitable nesting habitat. Predation of turtles by river otters and bald eagles was observed in 2011; none was observed in 2012, but both otters and eagles were observed. Pond turtle workshop. WDFW staff and cooperators from the Woodland Park Zoo captive rearing and reintroduction program participated in a Population and Habitat Viability Assessment for the western pond turtle for 3 days in November 2012. The workshop was made possible by a grant from the International Union for Conservation of Nature (IUCN) to the Woodland Park Zoo. Experts in population viability analysis of rare and endangered species from IUCN led the workshop; a report of the results of the exercise will be available in 2013. Partners and cooperators: Bonneville Power Administration, Woodland Park Zoo, Oregon Zoo, Pierce County Public Works, Pierce College-Veterinary Technology Program, Washington State Parks and Recreation Commission, USDA Forest Service Scenic Area, Washington Department of Natural Resources, Larch Mountain Correctional Facility, U.S. Fish & Wildlife Service, Pierce National Wildlife Refuge, Clark College, Skamania County Weed Control, Skamania County Forest Youth Success Program, Frank and Kate Slavens, and Weyerhaeuser. Hays, D. W., K. R. McAllister, S. A. Richardson, and D.W. Stinson. 1999. Washington state recovery plan for the western pond turtle. Washington Department of Fish and Wildlife, Olympia, Washington. Holman, E., and D. Anderson. 2013. 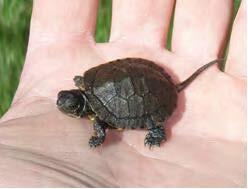 Western Pond Turtle Project Report, 2012. Washington Department of Fish and Wildlife, Vancouver, Washington. 15 pp. Holman, E., D. Anderson, M. Vander Haegen, G. Olson, W.-Y. Chang, and B. George. 2012. 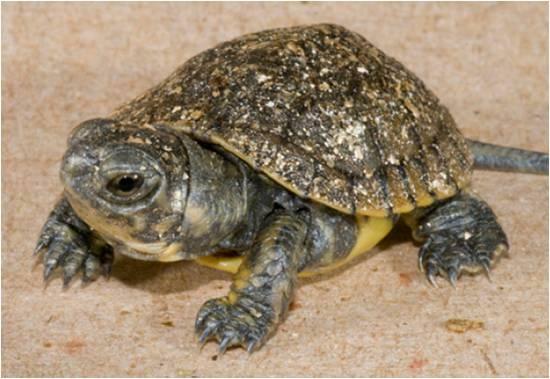 Western pond turtle project report, March 2011 – February 2012. BPA Project #2001-027-00, Contract #00052092. Washington Department of Fish and Wildlife, Vancouver, Washington. Vander Haegen, W. M., S. L. Clark, K. M. Perillo, D. P. Anderson, and H. L. Allen. 2009. Survival and causes of mortality of head-started western pond turtles on Pierce National Wildlife Refuge, Washington. Journal of Wildlife Management 73:1402–1406.